specifically for street rods and high performance street vehicles. approximately 850 -1000 RPM and increase gas mileage. These transmissions are custom built to your application. ~ Special valve body modifications for positive shifts. ~ 10 vane pump with special modifications. ~ 9 clutch 3-4 pack. ~ This unit can be set up for lock up or non-lockup torque converters. ~ Steel sleeve in forward drum. ~ Extra thick sunshell with bearing. 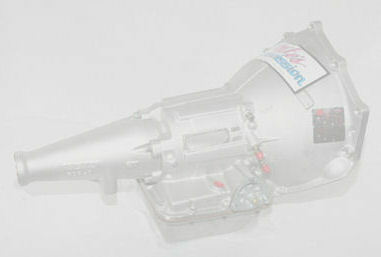 ~ Custom built 10" non-lockup torque converter (see converter page). 700R4 Overhaul kits - Call for price! for your needs ! No wasted money on parts that you don't need. This input sleeve presses over input shaft to strengthen the input drum. This cast aluminum pan holds extra fluid and comes with metric bolts. It does not require a filter extension. ~ Universal case that fits Buick, Pontiac, Oldsmobile, Cadillac & Chevy. ~ Heat treated forward hub. Fabricated deep pan with rear pick up. MT 2001 -2004R Deep pan kit........call for price. MT 2002 - 2004R Deep pan kit........call for price.